When I was in England earlier this month, I saw four plays at the two venues most closely associated with William Shakespeare – his hometown of Stratford-upon-Avon and the Globe playhouse on London’s South Bank. At the Globe, there was a gender-switching Hamlet and a time-switching Winter’s Tale, and on the Royal Shakespeare Company’s two Stratford stages, a bloody Macbeth and a revenge tragedy, The Duchess of Malfi, by Shakespeare’s bloodthirsty contemporary John Webster. 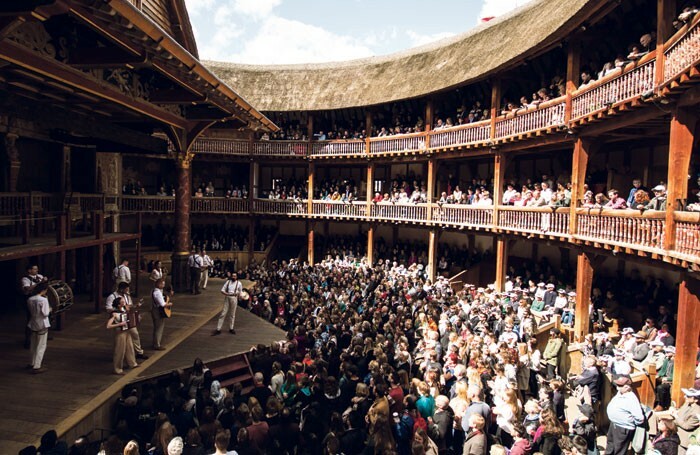 The heart of the complex known as Shakespeare’s Globe is a scrupulously accurate replica of the circular Bankside playhouse where many of the Bard’s works were first performed – that “wooden O” celebrated in Henry V – a stone’s throw from where the original stood. The thrust stage is flanked on three sides by an open space where the standee “groundlings” crowd up to the edge of the platform, and beyond that, three tiers of enclosed galleries with wooden benches (just as hard today as they were 400 years ago, but now you can rent seat cushions). Although the playhouse is open to the sky, the high walls and overarching thatched roof keep out the surrounding noise of street traffic, but not air traffic. Hamlet in particular was plagued by passing airplanes and circling helicopters which, at one point, quelled the dialogue so thoroughly that the actors simply stopped and looked up, ad libbing to laughter and applause. The Globe has a new artistic director with a new/old vision. 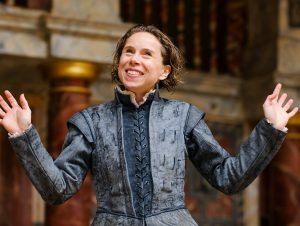 Michelle Terry – who appeared in the Valley a decade ago in the Globe’s touring production of Love’s Labour’s Lost – wants to recreate, at least partially, the “original practice” of Shakespeare’s plays. Two of the inaugural productions under her leadership are performed by the same small ensemble, playing multiple roles as necessary, and with gender-neutral casting – a modern twist on the Shakespearean-era requirement for boys to play the female roles – plus the now-standard practice of “color-blind” casting. 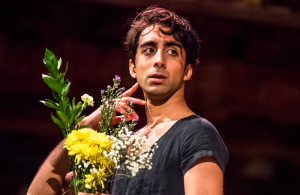 So in Hamlet, for instance, Terry herself plays the title role, and Shubham Saraf, a man, first plays Ophelia (in a dress and demure posture but without “feminizing” his voice or haircut) then comes on later as the courtier Osric. In a post-show talkback, Terry stated her belief in Shakespeare’s universality of thought and feeling, leading not only to the conviction that “anyone can play any of these characters,” but to a broader sense of inclusion. Nadia Nadarajah, who is deaf, signs her dialogue as Guildenstern, which is sometimes rendered in speech by Rosencrantz (Pearce Quigley) and sometimes understood from context and inference by us non-signers. This motley approach carries through the fast-paced production, co-directed by Federay Holmes and Elle White and developed collaboratively with the cast, another departure from today’s usual practice. The costumes are mostly Elizabethan, with contemporary flourishes: a soldier in armor has a Thermos on his belt, and the troupe of players, “the abstract and brief chronicles of the time,” wear jeans and t-shirts. Polonius (Richard Katz) sends his son Laertes off to college with a check to cover his expenses. And so forth. Terry is no melancholy Dane, but an impatient, immoderate, pissed-off Hamlet who sulks and snaps and who feigns madness in a whiteface clown getup. The famous words pour out in a torrent, giving the prince, and the production, a blistering energy, but tending at times toward shrill at the expense of sense. For me, the most delightful and effective demonstration of “original practice” is the performers’ active relationship with the audience, treating us as “another character in the play,” as Terry put it. Every opportunity to share asides and jokes with us is taken, which also applies to the soliloquies. For “To be or not to be,” Terry throws off Hamlet’s “antic disposition” and sits on the edge of the stage among the crowd – on the afternoon we were there, taking the hand of a young woman and speaking directly to her. The other play in Terry’s shared-ensemble initiative is As You Like It, but it wasn’t in the repertoire the week we were there, so we took in a performance of The Winter’s Tale. Though it has a different cast and director (Blanche McIntyre), it shares a lot in style and tone with the others. These include a snappy pace, role-doubling, cross-gender and color-blind casting, live original music played from the upstage gallery, and the sense that we, the audience, are part of the action – onlookers in the royal court, merrymakers in a rustic festival. There’s also plenty of breezy anachronism. The dumb Clown (Jordan Metcalfe) has a smart phone and the rascally con artist Autolocus (Becci Gemmell) hawks her gaudy “trumpery” – t-shirts, sunglasses, sun hats, and “ballads,” in this case 45-rpm records – from atop a seaside souvenir cart rolling among the groundlings. This tale of two kingdoms, one dark with suspicion and sorrow, the other bright with spring promise, invites contrasting visual styles. Here the disparity leaps centuries and continents. The cold, formal court of King Leontes of Bohemia (Will Keen), whose misguided jealousy of his wife Hermione (Priyanga Burford) leads to tragedy, looks vaguely Arabian Nights, while sunny Sicilia’s garb is modern-casual. In the first scenes King Polyxenes of Sicilia (Oliver Ryan), in his white-linen summer suit, is conspicuous as the visiting foreigner among Bohemia’s flowing gowns and billowing breeches. For me, the central character in the play is sharp-tongued Paulina, who defends Hermione and ultimately brings her back from the dead. 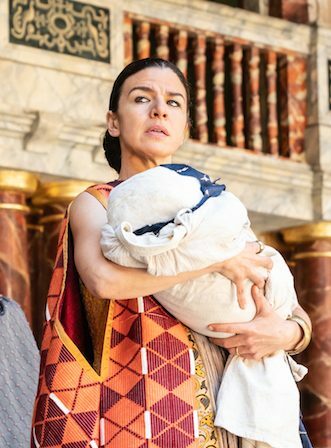 Sirine Saba magnificently claims that key position with the most memorable performance I saw at the Globe – bitingly sarcastic, politic when needed but volcanic when angered. The scene in which she gives Leontes a furious dressing down evoked spontaneous cheers – the kind of audience involvement that harks right back to Shakespeare’s time. Hamlet and As You Like It are playing in repertory till August 26th, and The Winter’s Tale continues into October. Last week a new production of Othello joined the schedule, with André Holland as the Moor and Mark Rylance as Iago, also running into October. In my next post I’ll report on the Royal Shakespeare Company in Stratford.